Needless to say Kodak Alaris and the Kodak Express Network were thrilled to be voted number one by the public in their respective categories. 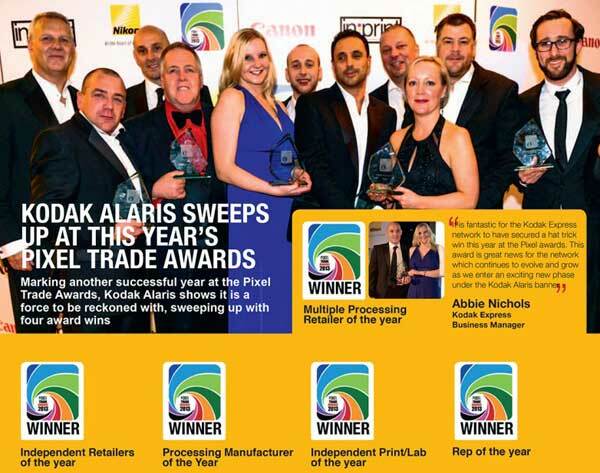 There has never been a better time to join the Kodak Express network with Kodak Alaris, a new company formed in 2013, and the appointment of a new Kodak Express Business Manager, Mike Piggin, both committed to strengthening the Kodak Express network and the benefits delivered to its members. "We have worked hard over the last couple of years on key strategies to drive footfall into our shops and this is now paying off. Kodak Express is an expanding and vibrant network that now offere a complete solution for both retailers and customers." "It is critical to demonstrate to retailers that they will get a solid return on their investment. Whatever the size of the business, Kodak's modular range of retail solutions allows me to put together a package to help them maximise their potential." VHS, SVHS and VHS-C copied to DVD and editable AVI computer files. Pop in to our London studios for a fabulous graduation photo shoot. We provide the cap, gown and certificate.